architect; b. 1430 (at Settignano, Italy); d. 1501. Although not mentioned by Vasari, Meo was undoubtedly one of the leading architects of his time in Italy. About 1462 he entered the service of Pius II (Pope 1458-1464), and assisted in the construction of the loggia of the Benediction at the Vatican. He was employed by Paul II (Pope 1464-1471), at the Vatican, and at the Palazzo di S. Marco, Rome. Meo built the cathedral of Turin, probably between 1471 and 1491.
sculptor; b. 1435; d. March 2, 1484. Niccolo was born at Bari in southern Italy. He worked at first in Naples, and established himself in Bologna when quite young. He formed himself especially on the sculpture of Giacomo della Quercia. His earliest known work is the equestrian bas-relief of Annibale Bentivoglio in the church of S. Giacomo Maggiore at Bologna. He derived his name from the Arca or tomb of S. Domenico in the church of that saint at Bologna, of which he was the principal sculptor. It was begun by Niccolò da Pisa. May 27, 1462, he succeeded Geoffroy Richier as maître d'œuvre of the cathedral of Rouen. Between 1463 and 1467 he completed the portail de la Calende and the tour Saint Romain. In 1484 he built the portal of the tour de Beurre, of which he built one story. He built the screen of the choir and the sacristy. Column from the Library at Cesena. Entrance façade in the library of Cesene, founded in 1462, by Malatesta Novelle, brother of Sigismond Malatesta, lord of Rimini. 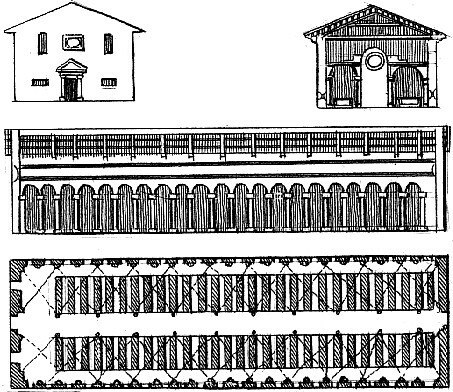 Transverse section, plan, and longitudinal section of the above.